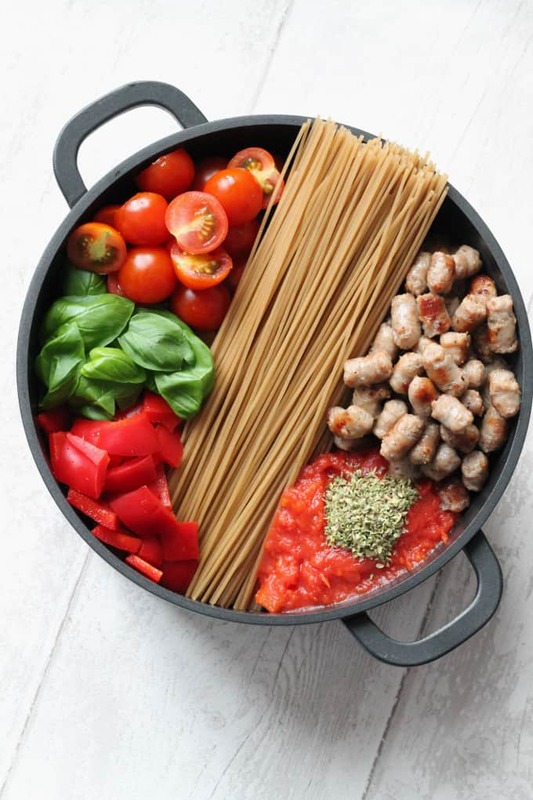 Quick, easy and convenient, this gluten free One Pot Pasta is made with organic brown rice spaghetti and a creamy sausage and tomato sauce. 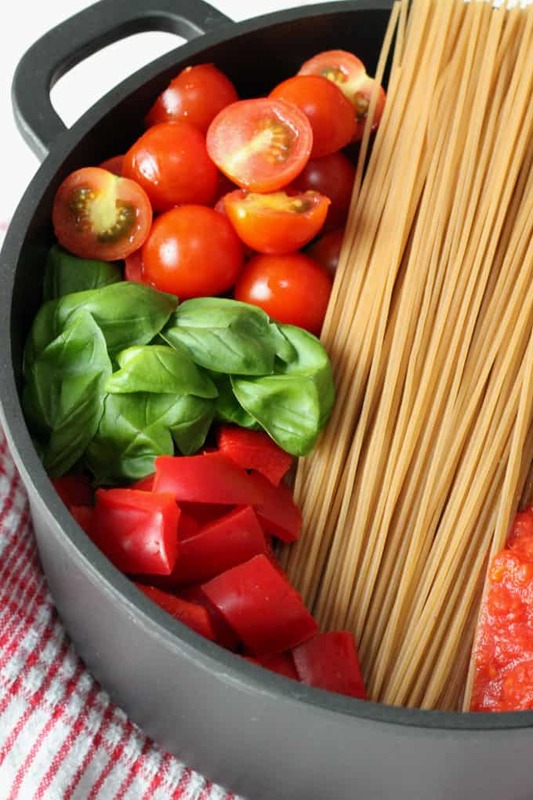 If you are a fan of Pinterest then you are sure to have come across One Pot Pasta before. It has pretty much been all over the internet for the past year and as usual I am late to this party! Cooking pasta and a sauce separately isn’t exactly the most labour intensive task anyway, but there’s just something so appealing about being able to chuck all the ingredients into one pan and having less to wash up afterwards is always a bonus! Despite the benefits, I have to admit that I was a little skeptical about One Pot Pasta. 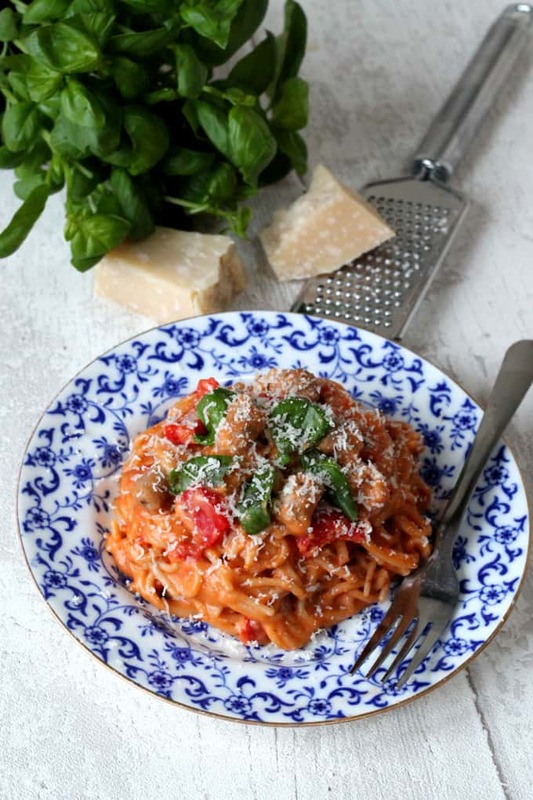 How could that starchy murky water left over from cooking pasta make a decent sauce? Surely all those people raving about it couldn’t be wrong and so I decided to give it a go. I haven’t eaten regular pasta in a few months as I am pretty much eating a gluten free diet now but it was always my ultimate comfort food and I really do miss it. I was sent some Rizopia Pasta to try recently and so the timing was perfect to try out my own version of One Pot Pasta. Rizopia pasta is made from organic brown rice and makes a great alternative to white flour pasta whether you eat entirely gluten free or are just trying to cut down on the amount of gluten you eat. 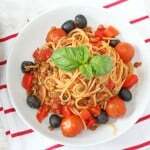 I used Rizopia Spaghetti in this recipe but most of the other pasta shapes from their range would work just as well. I decided on the sausage and tomato combo for my pasta sauce as my family are sausage mad. My fussy eater in particular is a big fan and she would probably eat them three times a day if I let her! I used gluten free chipolatas in this recipe but you can use any type or size of sausages that you like or leave them out altogether for a vegetarian version. You could also change up the vegetables and herbs used in this dish depending on what you like or what you have in the fridge to use up. I would recommend still using tinned tomatoes in this recipe however as I have not tried it without these so I cannot guarantee the dish would work as well. 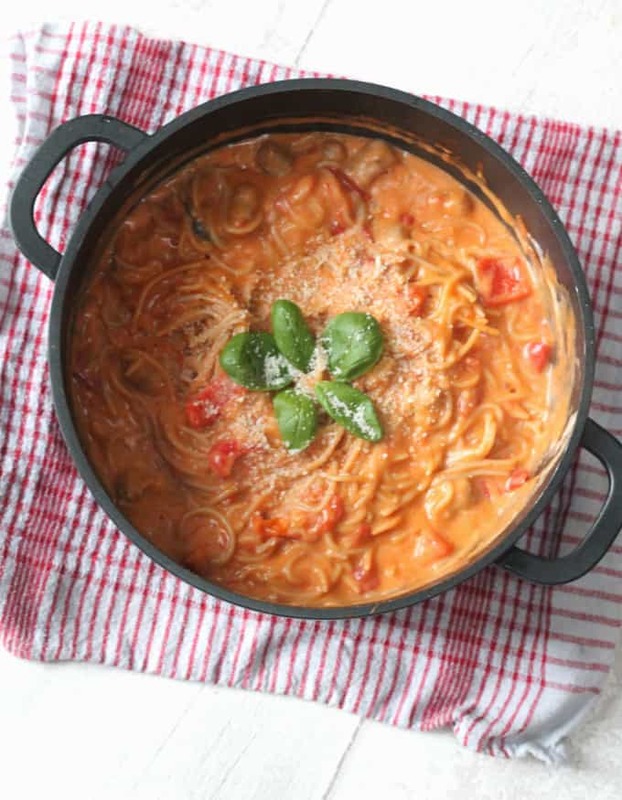 Have you tried One Pot Pasta before? Are you a fan? I have to say I am so impressed with this. It’s quick, easy and so convenient. My kind of dinner! In a large saucepan heat the olive oil and add the sausages. Fry gently for 5-7 minutes until the sausages start to brown. Add the spaghetti, red pepper, cherry tomatoes, tinned tomatoes, boiling water, stock cube, basil leaves and oregano. You may have to snap the spaghetti in two to get it all to fit in. Stir and bring to the boil. Reduce the heat and allow the pasta to simmer for approximately 12-15 minutes or until the water has almost all been absorbed. Remove from the heat and stir in the creme fraiche. Garnish with the remaining basil leaves and grated parmesan. The amount of liquid needed for this recipe was calculated on the basis of using brown rice spaghetti. You can use normal pasta or another gluten free pasta in this dish but please be aware that this may alter the amount of liquid required. It is always better to start off with a smaller amount and you can continue to add more if needed. **DISCLAIMER** I was sent two complimentary packets of Rizopia Pasta to try. All views and opinions about this product are my own. 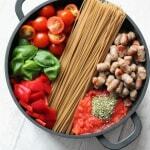 I’m a one pot pasta convert! Really creamy and tasty. Yum!!!! 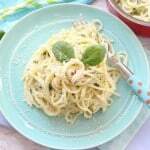 Can someone tell me if the ingredient (creme fraiche) is an actual ingredient that is required to make this pasta? The only thing I ever get when I click the “name” is an advertisement. Hi Lou. Creme Fraiche is what makes this dish “creamy” but can omit it if you choose or else substitute double cream. Thank you Vicki. That means a lot coming from you! Hope you enjoy it Polly! I have to admit I’ve not tried one pot pasta before (if you’re a year behind them I’m two or three!!). 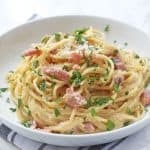 I agree with you that there’s something very appealing about one-pot dishes (they sound so simple and efficient) so I’ll definitely try one-pot pasta. It’s definitely worth trying Charlotte. I love having easy recipes to hand on busy evenings!